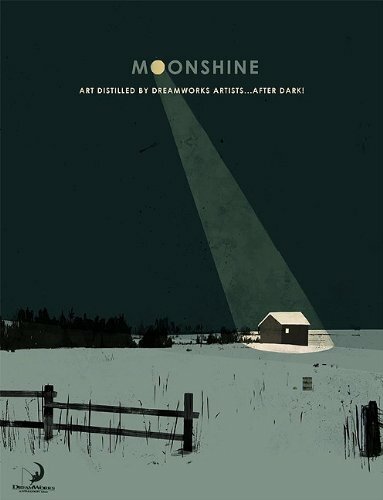 Book Review: Moonshine: DreamWorks Artists...After Dark! Having own a few DreamWorks art books, I always wondered when their collaborative art book would be out. And it's finally out, as Moonshine. 49 artists from DreamWorks has their personal art featured. This includes art from character designers, visual development artists, production designers and art directors. You will see very familiar names like Nicolas Marlet, Nathan Fowkes, Dominique Louis, Chris Appelhans (typo error on contents page, guys! ), Paul Lasaine and a whole lot more of talented artists. The art is beautiful and varied, ranging from sketches to background paintings. I must point out that this book feels very different from your DreamWorks movie art books as there's no overlaying theme and only personal works are featured. I do recognise some of their styles and is pleasantly surprised and delighted to find that Samuel Michlap has a few of his impressionist-style paintings inside. Also characters from Nicolas Marlet are easy to spot. The good part about this book is you get to discover new artists, together with their websites and blogs which are listed in the index. So you can check out even more art online. Already ordered this and Spectrum 17. Can't wait until it arrives. Parka. Two questions. Are you gonna review The Art of Beauty and the Beast? And my second question. Do you know where I can get an affordable "A Sketchy Past" by Peter de Seve the English version? I'll be reviewing Beauty and the Beast art book in December. i wouldnt order from labyrinth books. i placed an order on october 28, they said it wouldn't ship until November 5. i said thats fine. i wait and wait, then i get an email on November 16 saying they still haven't shipped it yet; the reason being that "things have been really crazy lately." so here its november 22 and still i have no book. that being said, you can get 'a sketchy past" from the society of illustrators site. Decent price you think? Amazon they're already in the $150.00 range. If you're going to buy at $150. I would rather you buy the French edition of A Sketchy Past. The only text is the introduction. why is the Design Studio Press version so much more expensive than the Titan books version? even if it were out of print....$100+ is going a bit far when compared to Titan's offer of $18...IS there any difference at all? PS- Amazon UK have it in stock without any notice of limited stock. Some of those prices are made by pricing programs automatically and may have no bearing to reality. This is different than the "Tale as Old as Time" Beauty and the Beast? Thanks Parka for checking the POC book. On nevermind, I didn't notice the year old date on this thread!